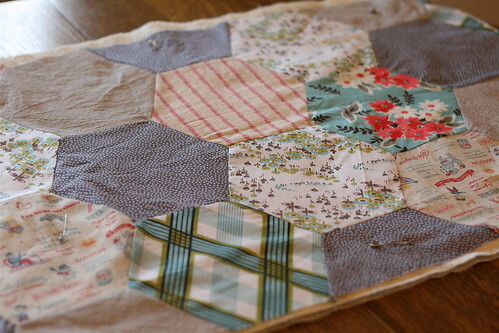 I had hoped to show you a finished Hex Table runner today, but my hand-quilting was off-kilter and I had to rip it out and start over! These things happen (all the time). This hexagon templates are included in Malka Dubrawsky's Fresh Quilting and the fabric for it is a mix of in-stock Joel Dewberry, stripes, dots and a few old prints from my shelves. The hexes are machine pieced (which I've never done before) and I can happily say that they were pretty easy to put together. 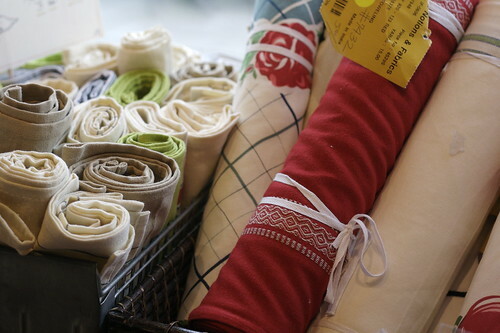 Our table runner this season is 2 yards of Moda toweling hemmed up at two ends! It looks a little scandinavian and could not have been easier or cheaper to put together (pictured above). We will be here to help you all weekend long as we're open today (Friday) until 6, Saturday 10-5, and Sunday 11-4.